It can take a long time for trendy tech to reach the remote Canadian north. The iPhone, for example, came to Nunavut in 2008, a year after the rest of the country (which, in cellphone years, is an eternity). But when the latest gadget arrives, it gets a uniquely northern welcome from designer Sherlyn Kadjuk. At her Arviat, Nunavut-based studio, Kiluk, she hand-makes laptop bags, iPad cases and smartphone covers out of sealskin. The silvery totes are sleek and sophisticated, but the fur adds the kind of warmth and coziness that could only come from one of the coldest regions on Earth — the shores of Hudson Bay. From $37.50. Through ivalu.ca. This piece originally appeared in the Globe and Mail on Thursday, January 3, 2013. 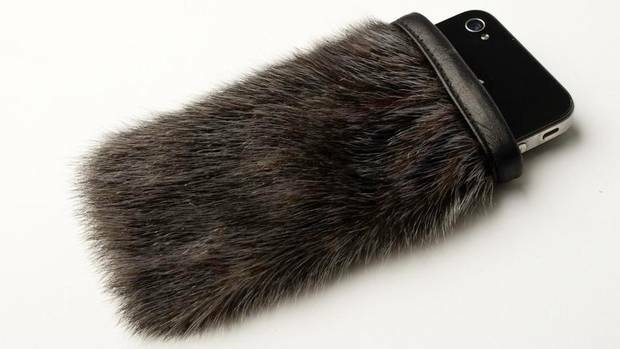 This entry was posted in Design Spy and tagged Arviat, Canadian Design, Design, iPad, iPhone, Ivalu, Kiluk, Nunavut, Sealskin by mmhague. Bookmark the permalink.